Every year since we were our in our twenties, some good friends and I spend a few days each fall and spring to fish the runs of Lake Superior trout as they migrate up their home rivers. 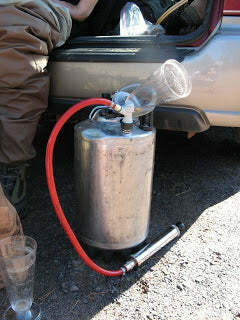 Every fall and spring I brew a batch or two of beer for the trip. Nothing emphatically seasonal about these fall-run and spring-run beers - no Oktoberfest or pumpkin beer in October or Maibock in April - but the solitary brewing and communal enjoyment of them commemorates our own seasonal migrations and makes for a unique and tasty way to collectively mark the passage of time; a quiet constant next to the flashing-by signposts of life: jobs, wives, babies, the occasional bright fish. Flies are tied to the chugging sounds of airlocks; tackle gets checked, tested, sorted, packed, unpacked, rechecked, retested, and repacked against the contrasting backdrop of patiently silent secondaries; layers of fleece and Capilene are staged on carbonating kegs. The selections are, by some long-standing and unspoken agreement, always ales, usually something from the pale ale family: ESBs, bitters, IPAs of the American and/or Imperial varieties. A big robust porter or strong stout is not unheard of (one of these years I'm going to plan it out and have a burly Baltic porter ready ... maybe Spring '11). Spring-run beers reflect a certain amount of cabin fever (or shack nasties, depending on where you hang your waders in the off-season), pent-up energy coupled with honed homebrewing chops from lots of cold-weather batches ... a more experimental, agitated mood. Like late-season snow sloughing off a balsam fir down the back of your jacket as you walk beneath it, rye and wheat and demerara sugar and all kinds of other things find a way into unexpected places. Like returning to a favorite pool after a long winter to find it totally changed by downed trees and runoff, yeast strains you haven't tried in a while get reintroduced and a familiar recipe suddenly surprises you. Fall-run beers reliably make lascivious use of just-harvested homegrown hops: an all-Centennial wet-hopped IPA in '07, a standard bitter with Wyeast 1275 finished and dry-hopped with Centennial (try it!) in '06, an all-Centennial American pale in '05 ... you get the idea. The first four-day stand of Fall 2010 starts in a few days, and this year's beer is kegged as of last night, absorbing CO2 as I type. Suffused with hops from first wort to secondary fermenter (Centennial [natch], Simcoe, and lots of their best friends) to echo the pine-tinged air, its color saturated rust-red like the iron-rich South Shore mud, propped up with a caramel-tinged full body and unsessionable ABV to take the sting out of both the cold air and the inevitable thrown hook, busted tippet, or wader leak in 36 degree water. 4 oz Centennial @ 20"
0.5 oz Ahtanum @ 10"
0.5 oz Centennial @ 10"
0.5 oz Citra @ 10"
0.5 oz Strisselspalt @ 10"
2 oz Simcoe @ 0"
1 oz Amarillo @ 0"
Weddings, holidays, family reunions, sure; what other occasions do you brew for? What does your own beer commemorate for you?